Facebook Messenger or simply Messenger is an instant messaging free app and platform. Facebook Inc developed the standalone iOS and Android apps in August 2011. After that the company released new apps on different operating systems. Facebook also released dedicated web interface for Messenger which is messenger.com. Users either can download the standalone apps or use the website interface to benefit Messenger services. Other than the standalone apps and the web interface, users can also use the Messenger chat feature right inside Facebook account on desktop. If you don't know, you can use Messenger service without need to open Facebook account, just register using your phone number on messenger and start messaging. The good thing about the Messenger app is its completely free and runs no ads. The size of the app is around 58 MB and the app already crossed 62 Millions + downloads (at the time of publication). Messenger is simply texting, just like sending SMS from your phone but here you don't have to pay for every single messages. Messenger works with your existing mobile data plan or WiFi connection. Isn't it awesome, you can instantly reach the people in your life for free. You can send messages to your Facebook friends and as well as send messages to your phone book contacts. Simply add a phone number and send message. Messenger is more than texting. You can send messages as well as share photos, videos, GIFs, emojis, stickers, audio files and document files. You can also react to messages send to you by your Facebook friends or contacts. The Messenger also supports free voice and video calling. Create group using selected contacts and start conversation together. Create multiple accounts and switch to any account instantly. The standalone app also allows to chat with end to end encryption (optional). Users can also play games right inside Messenger. Follow the facebook messenger tips and tricks link from the below to explore more interesting features. Work without Facebook account: Android mobile users can sign up to Messenger app without a Facebook social account. Just need a name and phone number. Direct messaging: One can send message to other users without need to be friends. Users can send message if they have phone number of the other user. Floating chat heads: Floats a round icon on screen having profile picture every time for incoming messages, regardless of which app is open. Users can configure the feature in the settings. Works only with mobile app. Chat customization: Messenger allows to customize chat with colors, nicknames and group photos. Voice and Video calling: Users can do unlimited voice and video calling using the app. To make the video calling more interesting, users can use Facebook reactions top of their face. Users can select tons of Facebook reactions from the already added list. Users can also capture the video calling screen and many more. Multiple accounts support: In the Messenger mobile app, users can create multiple account. Switch to any account instantly. Secret conversations: Messenger allows users to send secret messages to each other using end to end encryption. Users can also send self destructing messages (messages removed permanently following an optional time period). Work only with mobile app. Live location sharing: From 2017, Messenger allows users to share their live location with friends or group of friends. The live location sharing is temporary for 1 hour at a time. Works with mobile app. SMS support: Using Messenger, users can send SMS to phone numbers of their contacts. Instant games: Users can play a tons of games right inside the Messenger mobile app. Play games and share score or achievement with friends or users can even challenge friends to beat the score. Messenger Day/Stories: Just like Snapchat's stories, Facebook's stories and Whatsapp's stories- Messenger allows users to share photos or videos as Messenger Day that automatically disappear after 24 hours. Works with mobile app. Reactions and Mentions: Messenger allows users to add reactions through emojis by tap and holding a message. Mentions let you put @ before a user name while in group chat to directly send notification to a particular user. Money transfer: This feature is only for the U.S users. Users can send money to friends using messenger. The feature also allows to perform group payments. Business interaction: Messenger allows users to interact with businesses. Users can make reservation, check order updates, and also chat with company customer service representatives in real time. If you have not used Facebook Messenger, then follow the below download link to install the latest version of the app. You can directly go to Play Store from your android phone and install messenger from there. 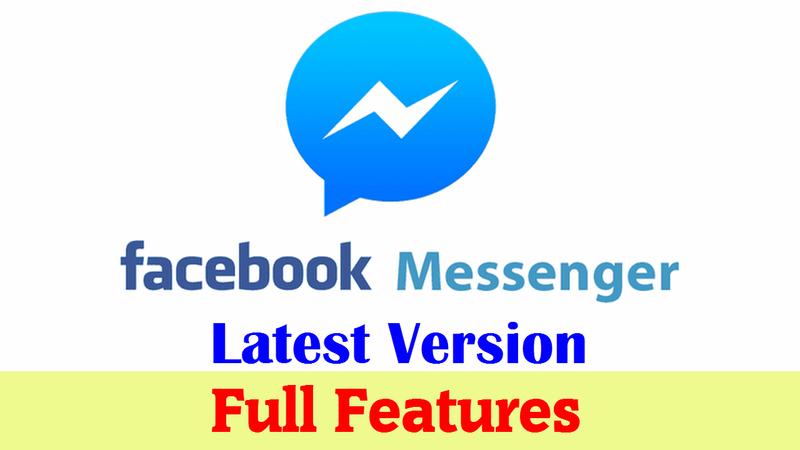 If you are already using Messenger then anytime you can follow the below download link to check for latest updates.